In my post earlier in the month I wrote about my aspirations for the layout and basic thoughts about what I wanted to achieve. I’ve also written around the computer software available for designing layouts, so in this post I wanted to bring some of that together with the design as it currently stands. This is actually quite an ask to fit into the space available, as it’s smaller than it initially appears due to the slope of the roof. At 2.8 x 2.4m of actual space and needing to keep a usable loft for storage did limit the basic options. The idea is that the top left is the two station and is a two track terminus. The station on the right is a main line through, with bay platform and is the country style. Above this is the level crossing, and then across the top is a set of sidings. The lower side will be the viaduct, and if I can work out how to fit it in sensibly then the canal and lock. In terms making the main line and terminus look sensible, the plan is that the terminus station will be raised up from the main board. If I can make it work then the sidings will actually go underneath the station – probably disguised by the use of an engine shed with effectively no back. 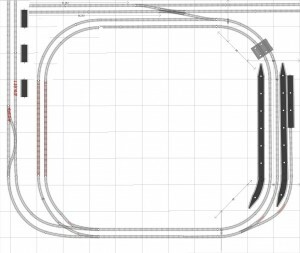 To make this work the heights for the whole left hand side of the layout are going to have to be carefully designed to minimise the gradients, however I think it can be done with a range between 1:50 on the main lines down to 1:30 on the sidings. More work is required yet on it – I need to finish the thinking around baseboard and track heights. The canal lock needs to be found a home that doesn’t look out of place – probably somewhere near the viaduct. The will come the detailed design of how to actually build the baseboard, with things like ensuring that the point motors will actually fit. So plenty to keep me going for a while! This entry was posted in Model Railway and tagged 2015, Canal, Gradient, Layout design, Model Railway, Station, Viaduct by John. Bookmark the permalink.